Since the early 1900s, Niagara Falls, Ontario, has been referred to as the “Wedding Capital of the World”; couples actually started honeymooning here in the early 1800s. Including brides and grooms of all ages, Niagara Falls, Ontario, welcomes about 12 million visitors every year. 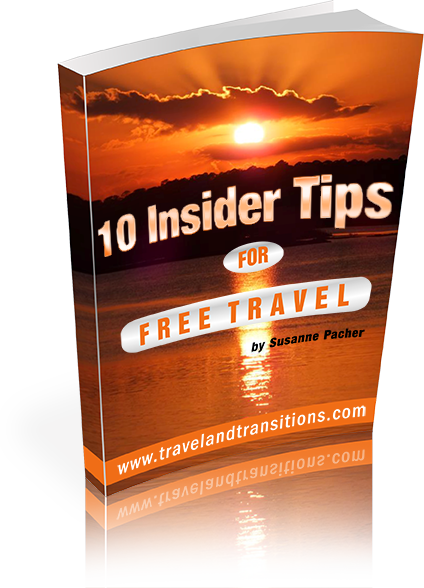 It is a particularly popular getaway destination for people from Toronto and other cities in central and southwestern Ontario. It is located less than 40 minutes from Buffalo, New York; less than five hours from Detroit, and within ten hours’ driving from many northeastern population centres such as New York City, Boston, Washington, Indianapolis, Chicago and Pittsburgh. Given its easily accessible location, its immense popularity and well-developed tourism infrastructure, Niagara Falls, ON, is also the first installment of the “Unique Travel Guide to Ontario” that I am currently working on. Tourism started in Niagara Falls already during the early 19th century; artists and travellers have been magically drawn to the mighty falls for centuries. Three impressive waterfalls capture the visitors’ attention: the American Falls and the Bridal Veil Falls, both located on the US side, and the famous Horseshoe Falls, most of which are located in Ontario. Even Irish author Oscar Wilde stayed in Niagara Falls, Ontario, during his 1882 visit. In 1953, Marilyn Monroe filmed the movie “Niagara” here, the film that first imbued her with star status. From 1881 onwards, the power of the Niagara River also became a major source of hydroelectricity, and some of the hydroelectric generating stations can be visited today in guided tours. 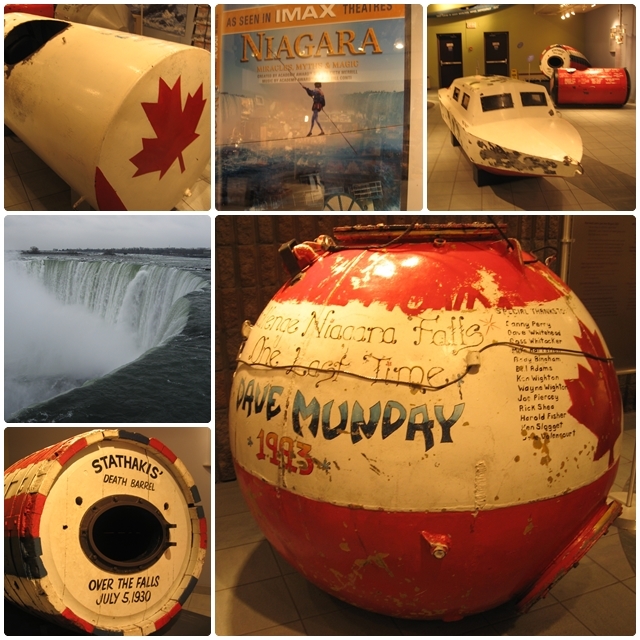 Many daredevils have tried to conquer the falls in barrels or other containers, and some of these thrill-seekers paid for their adventures with their lives. Today, it is strictly forbidden to plunge over the Horseshoe Falls, but despite these restrictions several people have gone across the Horseshoe Falls and even survived in recent years. Over the last 150 or so years, many tightrope walkers have crossed the Niagara Gorge on a wire, especially during the second half of the 19th century. Jean François Gravelet – also known as “The Great Blondin”, was one of the most famous ones. In 1876, a 23 year old Italian woman, Maria Spelterini, was the only woman to ever cross the Niagara Gorge on a tightrope. And in June of 2012, high wire artist Nik Wallenda successfully crossed the falls, the first person to do so in 116 years, with full permission of the Canadian and American authorities. Niagara Falls has attracted an eclectic bunch of people for many years. Niagara Falls, Ontario, has several important tourist areas. The first one is located next to the Horseshoe Falls and the Niagara River. Table Rock Centre, an observation and retail complex, is built right next to the Horseshoe Falls and home to the “Journey Behind the Falls” attraction which consists of several tunnels and an observation platform that take visitors behind the curtain of the Horseshoe Falls. Elements on the Falls Restaurant provides a dining experience with an up-close panorama of the Horseshoe Falls. Gorgeous parks and gardens line the Niagara River, first and foremost Queen Victoria Park with its rock garden, Hybrid tea rose garden and colourful flower beds. Adjacent to Murray Street is Queen Victoria Place, a historic building with a gift shop on the main floor and an upstairs restaurant with a gorgeous patio that overlooks the Falls. On the other side of Clifton Hill, the road that leads into one of Niagara Falls’ most popular entertainment areas, is the Oakes Garden Theatre, a spectacular garden with a curved pergola with two open stone pavilions that were constructed in 1936. 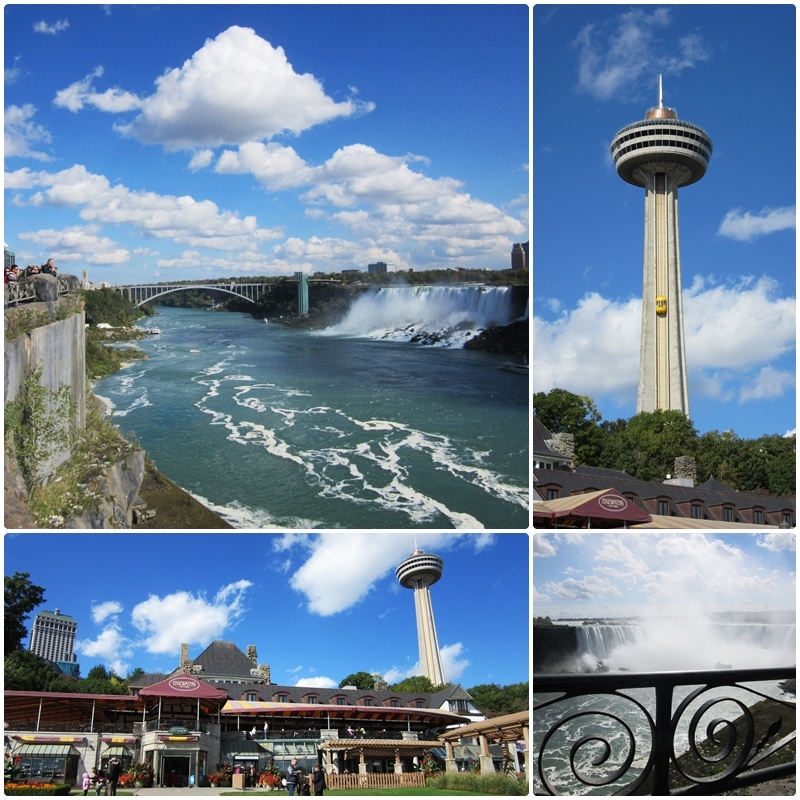 The view of the American Falls and the Horseshoe Falls from this location is spectacular. The scenic beauty continues along River Road which eventually turns into the picturesque Niagara Parkway that connects Niagara Falls, Ontario, with Niagara-on-the-Lake. 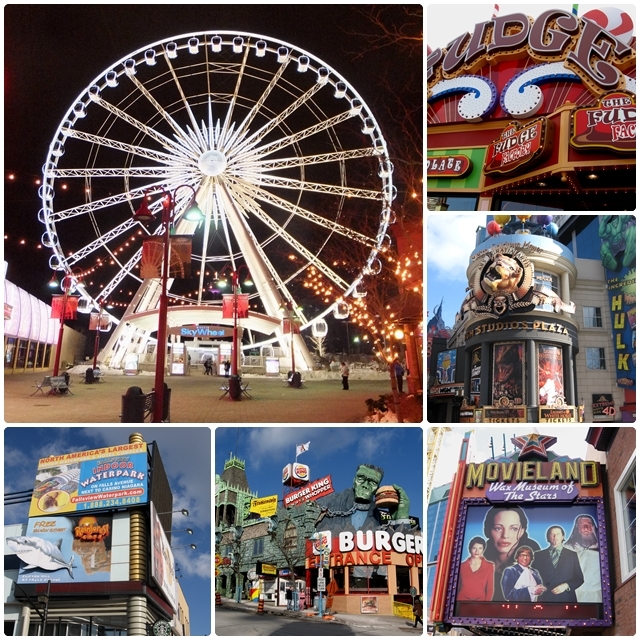 Clifton Hill is Niagara Falls’ major amusement area and boasts attractions such as the Ripley’s Believe It or Not! Museum, the Guinness World Records Museum as well as the Louis Toussaud’s Waxworks, one of several wax museums in the city. Miniature golf courses, haunted houses, video arcades and numerous restaurants vie for the visitors’ attention here. Since 2006, the Niagara Skywheel, a giant Ferris wheel with 42 Swiss manufactured fully enclosed gondolas, has been providing passengers with gorgeous vistas of the Horseshoe Falls and the American Falls during the ride that is about 8 to 12 minutes long. Another way to get a bird’s eye view of Niagara Falls is to go on a helicopter tour with one of several operators in the area. Also located in the Clifton Hill area is Casino Niagara which has been a major draw for gambling aficionados since 1996, offering over 40 table games and more than 1,500 slot machines. In our next article we will feature accommodation options and other attractions in Niagara Falls, Ontario.